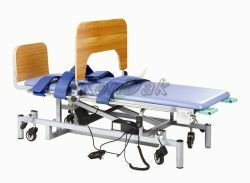 Hi low tilt table with remote control, adjustable activity tray, adjustable foot rest, tilt angle indicator, 3 support belts, large locking castor . 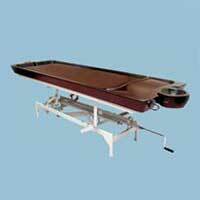 Height adjustable to wheel chair height. 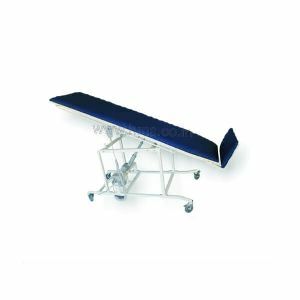 Powder Coated : Blue,Off White. 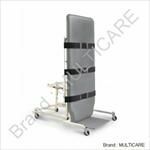 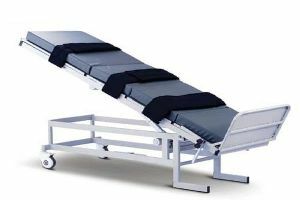 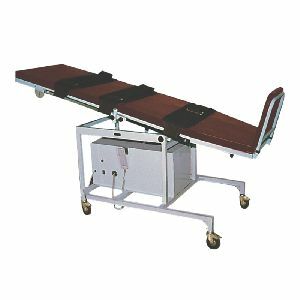 Electriclly operated tilt table with foam padded top provided with 3 straps to hold the patient.heavy duty motor provides silent & smooth lifting with remote switch.range of lits is caliberated top 0-90 degree. 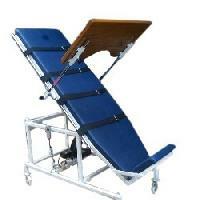 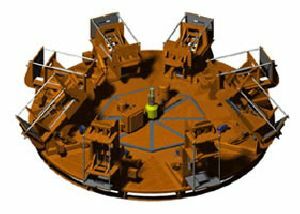 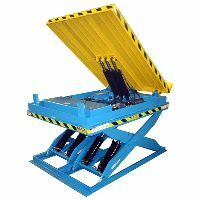 We are Leading Manufacturer, Supplier, Dealer & Exporter Of Electric Tilt Table. 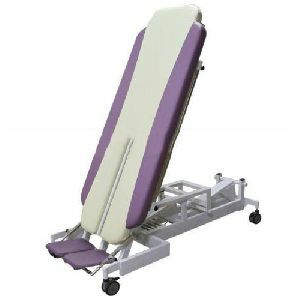 Features: * Elevated frames to allow proper lifter positioning * Heavy duty motor lift up to 500 Kg * Powder coated frames that resist rusting and scratching * Remote control for up-down adjustments * Angle indicator * Three extra wide movable patient positioning straps with locking swivel casters * Removable footrest. 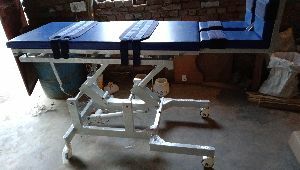 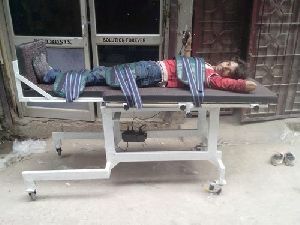 Motorised Tilt table to make the patients stand with support straps.This tilt table is used for long term Bedridden patients, Spinal cord injuries, Brain stroke cases ext..
Made of heavy duty 35mm mild steel tube legs with 10 cm dia wheels, tilt angles 0 to 90degree, the patient firmly holds to three straps provided. 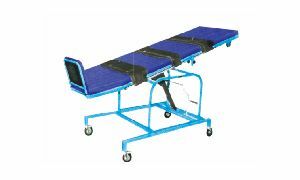 The table top is 61cm*195cm*80cm high. 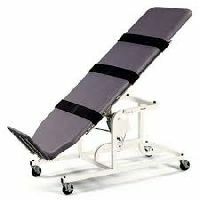 Two griping handles for various activities. 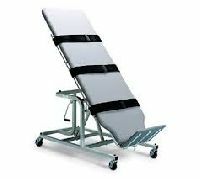 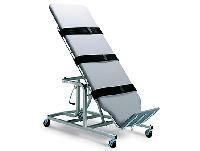 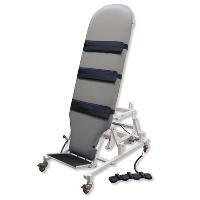 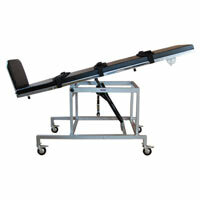 TILT TABLE MANUAL : Tilt angles 0 to 90 degree, the patient firmly holds to three straps provided. 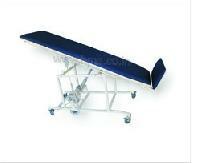 The Tabletop is 61cm x 195cm long x 80cm high, and on heavy-duty 35mm steel tube legs with 10cms. 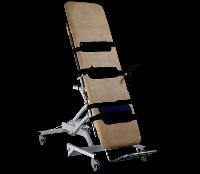 Dia wheels. 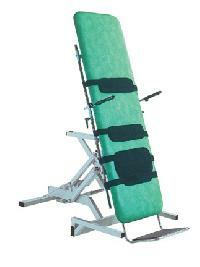 Two griping handles for various activities. 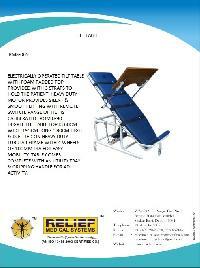 B. S. Physio Equipment & Rehabilitation..